The Byron Bay Writers’ Festival kicks off today and while I would be love to be attending this year I am stuck in Sydney looking at the program and quietly cursing….. Among the highlights of this year’s festival is the launch of not just another poetry anthology, but of a new Australian literary publishing house. If you are lucky enough to be in Byron for the Festival make sure you don’t miss the launch of Australian Love Poems 2013, edited by Mark Tredinnick on Sunday at 1pm at the Launchpad at the Lakehouse, 2 Bay Shore Bay, Byron Bay. It will be launched by author and columnist George Megalogenis and will feature a discussion with the editor of the anthology, Mark Tredinnick as well as readings from poets Kate Lumley, Phillip A Ellis, Michael Thorley, Rosanna Licari, Phyllis Perlstone, Candy Royalle, Erin Martine Sessions and Lisa Brockwell. 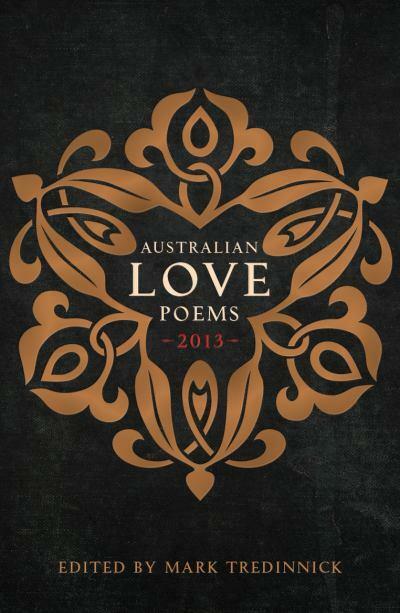 Australian Love Poems 2013 is the fist publication by Inkerman and Blunt who state that they are “dedicated to publishing books of originality, intelligence and beauty”. If their first book is anything to go by they are well on their way! The 200 poems in the anthology are grouped together into a number of different sections: ‘Unruly days’, ‘It can’t work, but nothing does’, ‘It’s time to take off our clothes’, ‘You and I sitting out the world’, ‘A betrothing rain’, ‘But I have known you in the winter, too’, ‘You are gone again’, ‘I’ve been drunk with you for millennia’, ‘We outgrow love like other things’ and ‘There is another universe in which our song is not yet finished’. This adds a certain level of ‘poetic complexity’ to the anthology which comes as an intriguing surprise when compared to the majority of anthologies that take the democratic, but simple, alphabetic path. While Rochford Street Review hopes to be able to profile Inkerman and Blunt in the future as part of series on independent literary publishers we are still insanely jealous that we are not spending the weekend in Byron helping to launch this anthology! Disclaimer – Mark Roberts has two poems in this anthology. This entry was posted in Australian Love Poems 2013, Inkerman and Blunt, Issue 8, Mark Roberts, Mark Tredinnick and tagged Australian Literature, Australian poetry, Byron Bay Writers Festiva, byron bay writers festival, Candy Royalle, Erin Martine Sessions, George Megalogenis, Kate Lumley, Lisa Brockwell., literary publishers, literature, Love poetry, Michael Thorley, Phillip A Ellis, Phyllis Perlstone, Poetry Anthology, Rosanna Licari by Mark Roberts. Bookmark the permalink. Wish I was in Byron for this too Mark. Feel very lucky to be helping launch it in Brisbane at BWF 13.